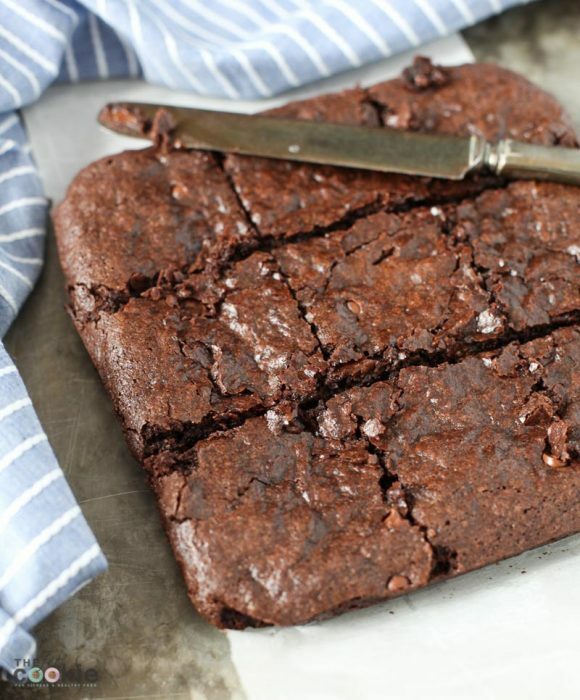 Looking for an allergy friendly brownie recipe? Make a batch of these Vegan One Bowl Fudge Brownies that are gluten free, nut free, and made with simple ingredients you probably already have in your pantry! Hey friends! This Vegan one Bowl Fudge Brownie recipe is one of our reader favorites (and a family favorite!) from March 2014, so I’ve updated the text, recipe, and images. And best of all, this recipe doesn’t have any strange ingredients like beans or avocado and not “healthified” (I want real brownies if I’m going to eat them!). These fudge brownies made with staples you probably already have in your pantry and it’s less mess since they are one-bowl brownies. Boom! 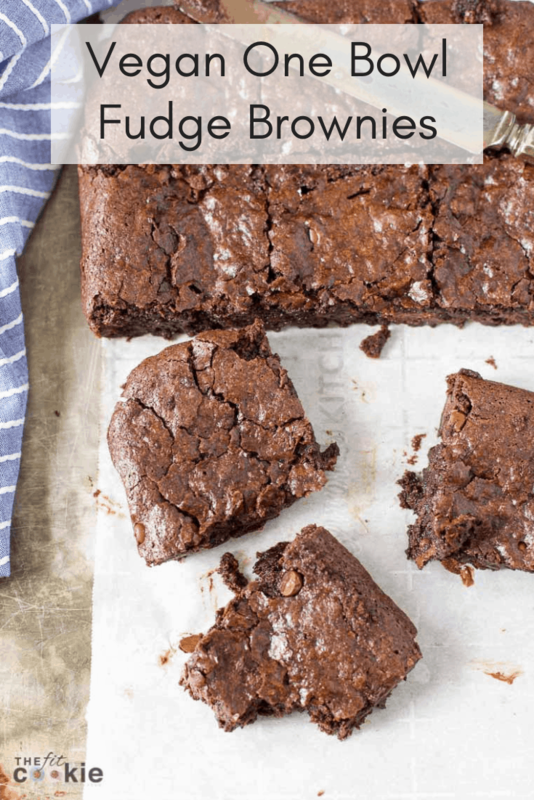 Take these Vegan One Bowl Fudge Brownies as a prime example: I love experimenting in the kitchen but I often have to deal with crazy recipes-gone-very-wrong since I have to replace ingredients due to our food allergies. I originally started re-doing one of my favorite traditional brownie recipes, the classic Baker’s One-Bowl Brownies, but I quickly learned that simply re-making this recipe with gluten-free flour wasn’t going to cut it! After several trial and errors, I came upon this amazing recipe you have before you, but before that batch, I failed a few times. Batch 1: too little flour and too much oil, ended up as molten brownie batter which cooled into a solid fudge. Very odd and quite delicious, but still not brownies. Batch 2: too much flour and still too much oil – ended up being like a crumbly super-dense chocolate shortbread. Again, yummy but not what I was aiming for. Batch 3: this batch actually turned out perfect! I completely scrapped the idea of re-doing the Baker’s One-Bowl recipe and just went with my gut this time. 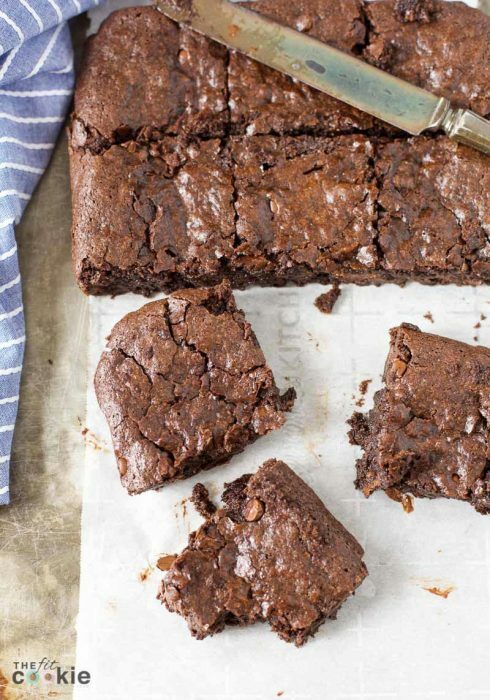 These brownies are easy to make (almost fool-proof!) and are nice and crispy on the outside and gooey on the inside. If you prefer cakey-type brownies, then you will have to look for a different recipe: these are fudgy inside (my favorite!). I used unbleached cane sugar in this fudge brownie recipe to give it that nice crust on top that I love so much, but you can use granulated coconut sugar here instead with similar results. It will just have that richer taste similar to using brown sugar. For the updated version of this recipe, I baked my batch for 30 minutes and they were super soft and gooey. 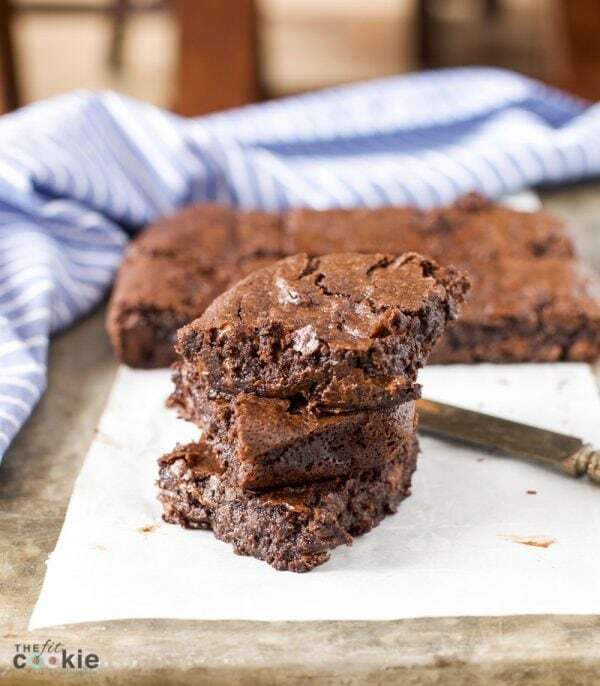 If you love seriously fudgy brownies, then 30 minutes is good for baking, but if you want them to firm up a little more, try baking these for 35-40 minutes, starting with 35 minutes then adding baking time 2 minutes at a time until you get the texture you want. 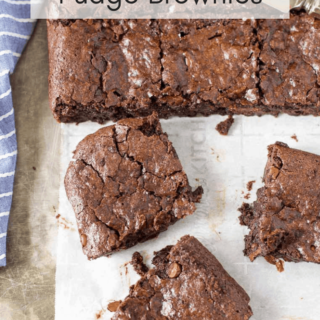 Just remember that these fudge brownies will firm up as they cool, so even if you want your brownies gooey, make sure you still allow your brownies to cool for about 15 minutes before cutting and eating them. 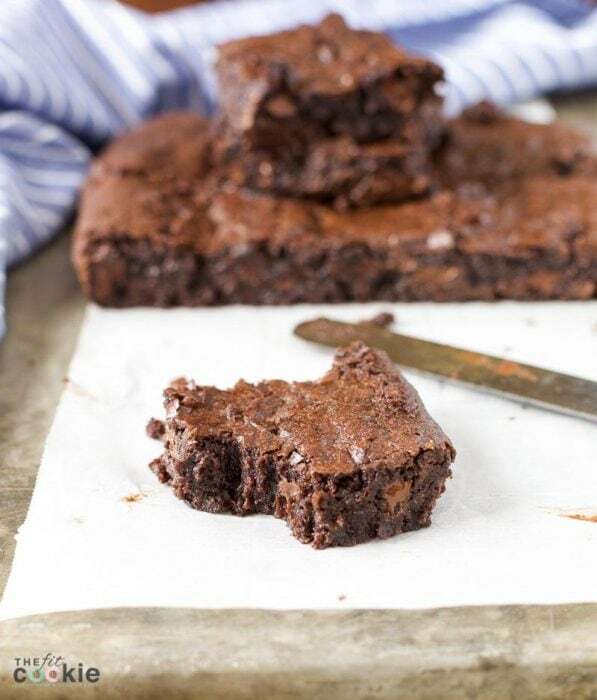 Please note: if you use a pre-mixed gluten free baking blend rather than the brown rice flour or sorghum flour called for in this recipe, the texture of these brownies won’t turn out fudgy or gooey like they should. Pre-heat oven to 350 degrees F. Line a 9×9-inch baking pan with parchment paper and set aside. In a large bowl, whisk together oil, rice milk, vanilla, sugar, and ground flaxseed. Whisk in cocoa powder and salt. Stir in the brown rice or sorghum flour and the chocolate chips until well mixed. This will form a very thick and sticky batter. Pour the batter into the prepared pan and spread out the batter. Bake in the pre-heated oven for 35-40 minutes or so (or 30 minutes if you want these to be super gooey). If you want these to be less gooey, cook for 35-40 minutes. Remove from the oven and allow to cool for at least 15 minutes before cutting and eating. These will firm up as they cool. 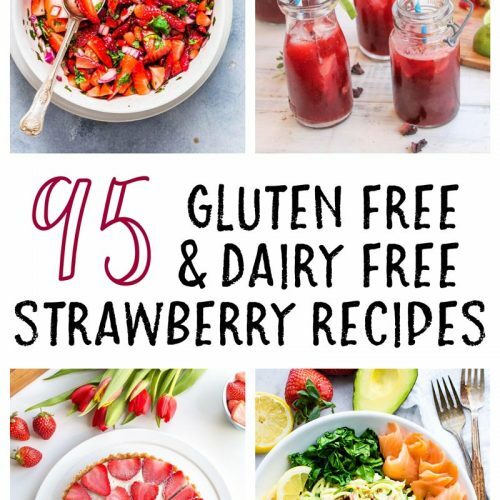 Note: if you use a pre-mixed gluten free baking blend rather than the brown rice flour called for in this recipe, the texture of these won’t turn out fudgey or gooey like they should. These are so good, I think you’ll love them! Second time making them. Delish! Wow they look good but a cup of sugar is still a lot! 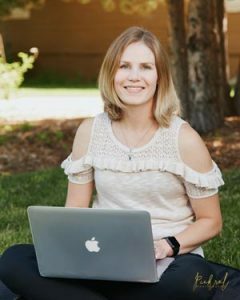 Have you tried subbing for honey? I haven’t tried subbing for honey, but 1 cup of honey is going to have the same amount of sugar as a cup of cane sugar, so you’re not reducing the sugar content of these brownies by subbing with honey (just subbing for a less refined sweetener). 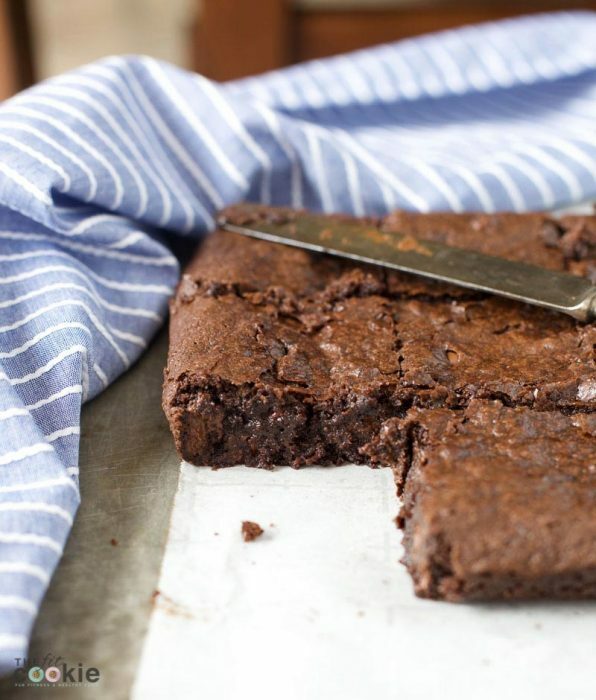 These brownies are meant to be allergy friendly, not healthy. If you want to reduce the amount of sugar in this recipe, you can try replacing half the sugar with some sugar replacement like baking Stevia. 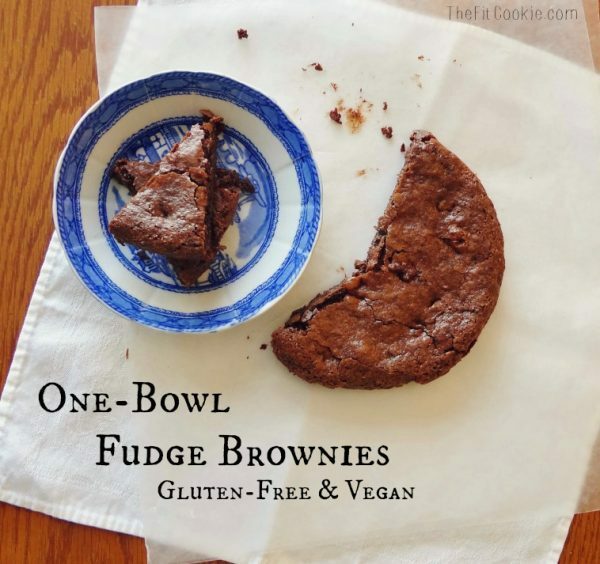 I’ve tried several V/GF brownie recipes, and none of them (until now!!) turned out quite like my mom’s regular recipe. I had to bake them about 10 minutes longer, but they came out with a crisp top and melt-in-your-mouth middle. I will definitely be making these again! Thank you! I will be making these again today. This will be the fourth time making them but today I’m doubling the recipe our family loves them!? We have added dried cherries and nuts to the last two batches and they turned out fantastic! I will be making theese for thanksgiving so my extended family can taste how good vegan food is! Thank you for the recipe. Sincerely, Aron (freshlymintedvegans) (youtube)???? These look amazing, but is there a nut free sub for ground flax meal. 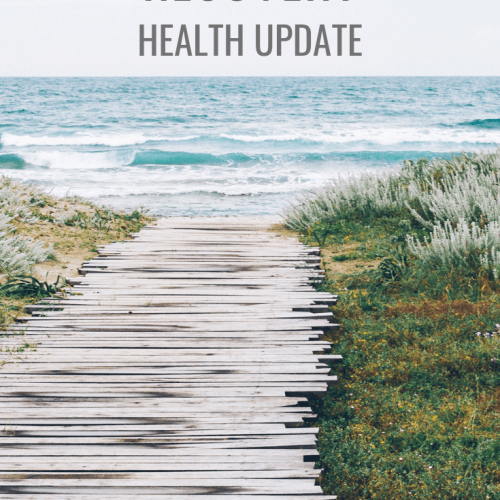 Egg, nut and seed allergy in the family. Could I use Tapioca starch? Hi Carly! I’d normally suggest using ground chia or psyllium, but those are both seeds so probably not what you guys can use. 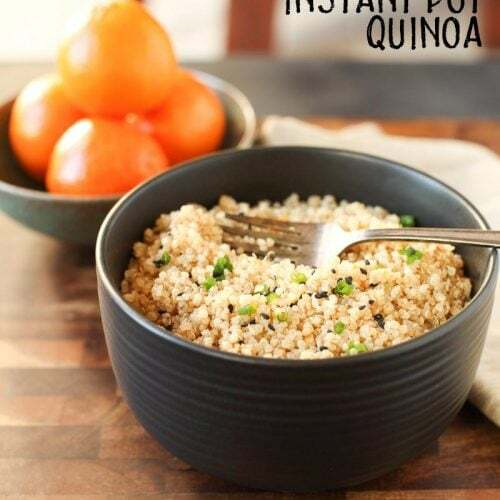 Instead of those, you could try a little bit of tapioca starch/powder (maybe 1 teaspoon to 1 Tablespoon in this recipe), it can act as a binder in some recipes. 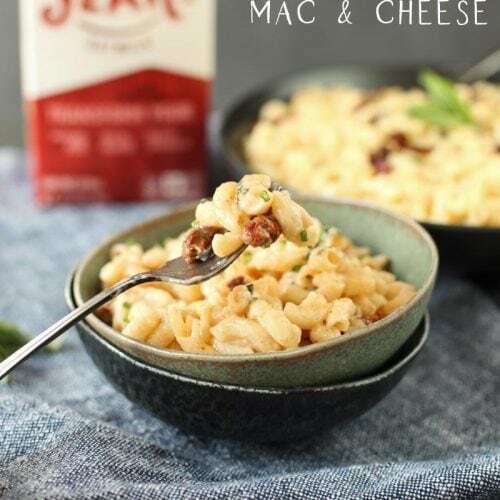 and xanthan gum or guar gum might also work (but I’d use a very small amount of the gums, like maybe 1/8 teaspoon in this recipe, it doesn’t take much!). I haven’t tried this with other binders besides flaxseed, so I’m not sure how it will turn out using other binders. Keep me posted and let me know how it turns out for you! This is the most delicious brownie recipie I have ever made! I am bringing it to my grand-daughter’s 1st Birthday party. I will definitely be making again and again…THANK YOU!!! This recipe worked soooo well! These completely satisfied my fudgy gooey craving! And i made double so after a day should i store it in the refrigerator ? Each time I make these, they come out ‘chunky’ and don’t look anything like the picture – but still good. I think it’s the flaxseeds – since I don’t have a 6-inch pan, I’ve been doubling the recipe and using the 9-in instead as described in the instructions above. I think the 1/2 cup ground flax might be too much? Any thoughts or help? Hi Shirley! Can you describe what you mean by chunky? Are they crumbly or lumpy? If they are lumpy, it’s possible the ground flax seed is clumping together in your batter. You can try sifting or whisking the flax seed first. You can experiment with less flaxseed if you like, it acts as the egg replacement and binder in this recipe, so I wouldn’t reduce it too much. They are lumpy and it’s definitely the ground flax. How many eggs are you trying to put in the recipe using the flax? I might try using flax eggs by mixing with water and microwaving first until it gets all goopy like a real egg before adding to the mix. Did you grin the flax seeds into a flour? Do you think these could be made grain free? 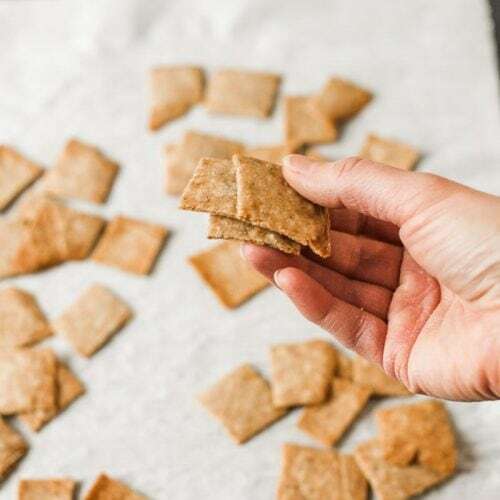 One thing you may check, too, is if you’re using straight brown rice flour or if you’re using a pre-mixed flour blend. If you’re using a gluten free flour blend, I these won’t end up with the right texture. wow girl!! 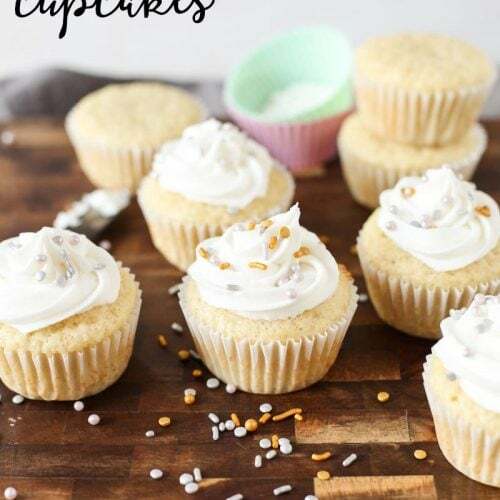 Making these tonight! This does look really good. I wish it was just as simple as subbing GF flour for all purpose! Love that you shared your foibles too! yum!! these look so soft and gooey and chewy and delicious!! Yay! 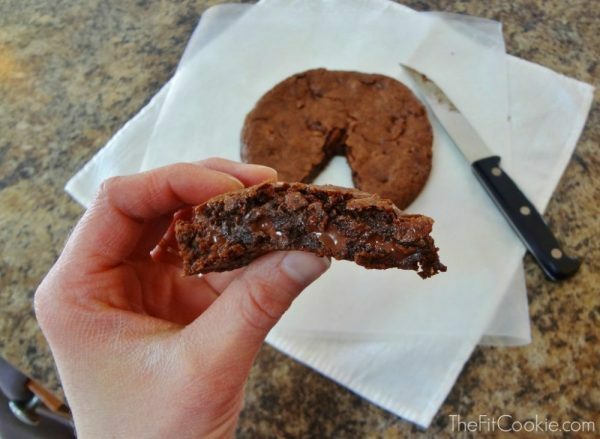 These look perfect- look at that melty chocolate. Can’t wait to try! Pinning the recipe now.